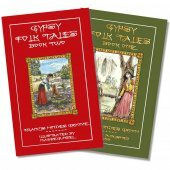 CHRISTMAS WHOLESALE SPECIAL - EASTERN EUROPEAN FOLKLORE SPECIAL set of 5 Books - 35% OFF! 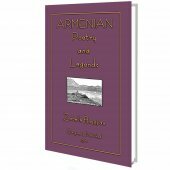 Herein you will find 5 books containing 84 Eastern European fold and fairy tales, plus tales of dragons, both magnanimous and evil, tales of princes on their white chargers dashing in to rescue princesses in distress and tales of the little people, the fairy folk that live in each and every fairy tale. These books were bestsellers when they were first published, some over 120 years ago, at a time when people REALLY DID BELIEVE in fairies. These are tales from the forests and lane-side hedgerows as well as tales of fairy dances, which only ever occur at midnight under a full moon. And then there are tales of how lowly labourers applied their brains to win the hand of princesses and become kings of kingdoms and other tales of how kings, forever protective of their princesses, set ever more difficult challenges to those wanting to win the hand of their daughter, who is, of course, the fairest and most beautiful maiden in all the land! 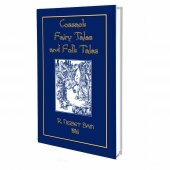 Ideal for parents, grandparents and lovers of fairy tales and all things magic! In addition it is a unique collection for primary/elementary school libraries. TEACHERS read a page or two from each story at the end of the school day and have your students queuing up to hear the next part of the story day after day. 978-1-909302-54-9 - Czechoslovak Fairy Tales 15 Stories, 236pg Illustrated. 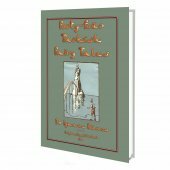 978-1-909302-55-6 - Fairy Tales of the Slav Peasants and Herdsmen 20 Stories, 398pg Illustrated. 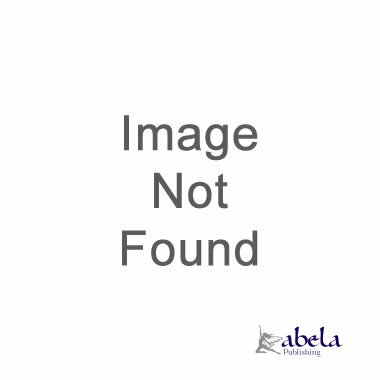 978-1-909302-23-5 - The Key of Gold - 23 Czech Folk Tales, 200pg Illustrated. 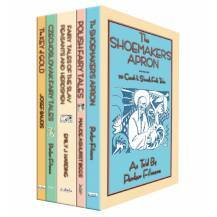 978-1-909302-44-0 - The Shoemaker's Apron - 20 Czechoslovak fairy tales, 270pg Illustrated. 978-1-909302-67-9 - Polish Fairy Tales 6 Stories, 192pg Illustrated. So, find a comfy chair, and sit back with a hot toddy, and enjoy a change of scenery and a change of pace and be whisked away to a land far, far away where only magical things happen. 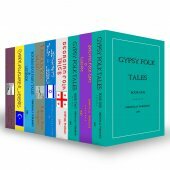 Excerpt from CHRISTMAS WHOLESALE SPECIAL - EASTERN EUROPEAN FOLKLORE set of 5 Books - 35% OFF! Her father was a rich farmer, and owned a large estate, but Jeans father was only a poor mountain shepherd. Annette did not in the least mind her lover being poor, for he was rich in goodness: nor did she think her father would object to their marrying. One day Jean put on his best clothes, and went to ask the farmer for his daughters hand. The farmer listened without interrupting him, and then replied, If you would marry Annette, go and ask of the Sun why he does not warm the night as well as the day. Then inquire of the Moon why she does not shine by day as well as by night. When you return with these answers you shall not only have my daughter but all my wealth. Jean willingly promised to make this inquiry, and the next day continued his journey.He walked on and on, over mountain and moor, through valley and dense forest, until he came to a land where there was no drinking water. The inhabitants, when they heard the object of Jeans journey, begged him to ask the Sun and Moon why a well, that was the chief water supply of the district, no longer gave good water. Jean promised to do so, and resumed his journey. After long and weary wanderings he reached the Suns abode, and found him about to start on his travels. O Sun, said he, stop one moment, do not depart without first answering a few questions. Be quick then and speak, for I have to go all round the world to-day. Pray tell me why you do not warm or light the earth by night as well as day? For this simple reason, that if I did, the world and everything upon it would be very soon burnt up. Hardly had the Sun finished speaking before he was obliged to hurry off, and Jean travelled far and fast to meet the Moon. On coming up to her he said, Would you kindly stop one moment? there are a few questions I should like to ask you. Very well, be quick, for the earth is waiting for me, answered she, and stood still at once. Tell me, dear Moon, why you do not light the world by day as well as by night? And why you never warm it? Because if I lit up the world by day as well as by night the plants would produce neither fruit nor flower. And though I do not warm the earth, I supply it with dew, which makes it fertile and fruitful. And she answered him thus: While the kings eldest daughter remained unmarried the tree bore fruit every year. After her wedding she had a little child who died and was buried under this tree. Since then there has been neither fruit nor flower on its branches: if the child be given Christian burial the tree will produce blossom and fruit as in the past. She replied: Under the mouth of the well, just where the water should flow, lies an enormous toad which poisons it continually: the brim of the well must be broken and the toad killed, then the water will be as pure and wholesome as formerly. Jean led them to the well and there explained the instructions he had received from the Moon, at the same time showing them what to do. Sure enough, right underneath the brim of the well they found a horrible toad which poisoned everything. When they had killed it, the water immediately became pure and transparent, and sweet to the taste as before. All the people brought Jean presents, and thus laden with riches he again set out. On arriving at the town where grew the unfruitful pear-tree, he was warmly welcomed by the prince, who at once asked if he had forgotten to question the stars about the tree. I never forget a promise once made, replied Jean, but I doubt whether it will be agreeable to your majesty to know the cause of the evil. He then related all the Moon had said, and when his directions had been carried out they were rewarded by seeing the tree blossom immediately. Jean was loaded with rich gifts, and the king presented him with a most valuable horse, by means of which he reached home very quickly. Little Annette was wild with joy on hearing of her lovers safe return, for she had wept and suffered much during his absence. But her fathers feelings were very different; he wished never to see Jean again, and had, indeed, sent him in search of the Sun with the hope that he might be burnt up by the heat. True it is that Man proposes and God disposes. Our young shepherd returned, not only safe and sound, but with more knowledge than any of his evil-wishers. For he had learnt why the Sun neither lights nor warms the earth by night as in the day; also why the Moon does not give warmth, and only lights up during the night. Besides all this he had brought with him riches which far exceeded those of his father-in-law, and a steed full of fire and vigour. So Annettes father could find no fault, and the wedding was celebrated with joy and feasting. Large quantities of roasted crane were eaten, and glasses overflowing with mead were emptied. So beautiful, too, was the music, that for long, long after it was heard to echo among the mountains, and even now its sweet sounds are heard at times by travellers among those regions.